Yesterday evening I was contemplating what the heck I was going to use for my Wordless Wednesday post this week. I haven't been doing a very good job with picture taking lately. So while doing what I do best, procrastinating on my iPhone, I noticed that my hubby had emailed me a picture. 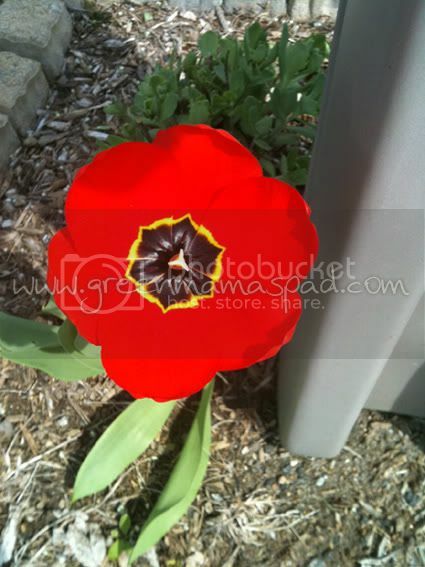 I opened it up to find this picture of our lone tulip out by our mailbox. I love the angle of this photo, taken looking down on it. It doesn't even look like a tulip! On a side note, even though we planted plenty of tulip bulbs throughout our property, this is the lone survivor. The moles ate the rest. And my daffodils. And hyacinth. I don't like moles. I don't like moles either, they dig holes all over my flower beds! Your tulip is beautiful, I haven't planted any at this house and miss seeing and smelling them! It doesn't look like a tulip. Beautiful shot! Thanks for letting me link up. Beautiful tulip! I wouldn't have thought it was a tulip either! So pretty! Hope you will have better luck next year! Thanks for the linky too! So pretty! Our tulips are starting to bloom as well finally! If it makes you feel better, it's one more flower than we have! Beautiful picture. We get moles too. They are horrible! That is the prettiest flower ever! Wow, my most favorite flower of all time. That's a tulip?! I would have assumed a poppy but it's very beautiful even if there's only one! Swing by if interested and link up. I have some the same exact color & center. the squirrels moved a few around in my yard... it is great to see color! WOW -- the color in that is amazing! It's a gorgeous photo and a beautiful angle. I know how you feel about the bulbs. Two years ago I planted 28 bulbs and only one flower came up, but it wasn't the squirrels that got them, I have NO idea what happened. It's pretty depressing isn't it.